Ginger Armstrong sent this picture. This picture is of the 2006 Spirit trumpet section and their instructors Chip Crotts and Ray Vasquez. 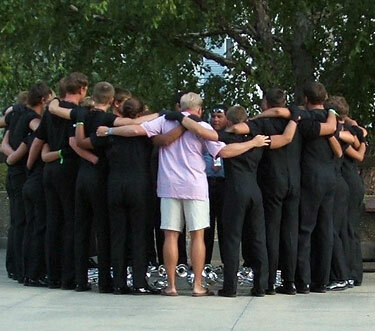 It was taken at their last warm-up together before their final performance in Madison at the 2006 DCI World Championships. It really sums up the bond that they had all season. Chip and Ray (and the rest of the staff) taught the 2006 members so much about drum corps and also about being good people and being a family. We are so proud of you!